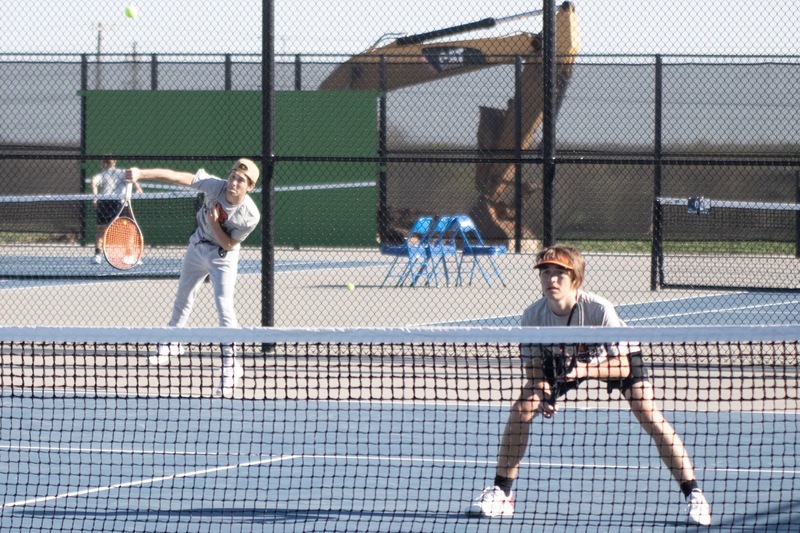 Kile Thornhill serves as Isaac Jordan waits at the net during the Tigers' #1 doubles match. Thornhill and Jordan won 9-7. Republic’s spoiled the opening of Carthage’s new eight-court tennis complex on its high school campus, romping to a 9-0 victory to stay undefeated at 8-0. Republic is 3-0 in Central Ozark Conference play and has beaten both of the future district opponents it has played. The only close call of the night came in the #1 doubles match, where Isaac Jordan and Kile Thornhill struggled to eke out a 9-7 victory over Adam Theis and Eric Ortega. Jordan and Thornhill trailed 7-6 before winning three games in a row to close out the win. Republic still hasn’t lost a doubles match all year. It’s the sixth consecutive win for Republic over Carthage. The JV squad improved to 4-1 this season with a 19-5 win. The Tigers play next Monday at home against Carl Junction (varsity only).